Styling Shorehaven is a collaboration with the teams from Reed and Co Real Estate and Casa Noosa Homeware/Furniture Store in Noosa. The home at 169 Shorehaven Drive, Noosa Waters was a vacant home being placed on the market and needed some interior updating and a fresh new look. But let’s make this BIG said Adrian (owner of Reed and Co), Open Home evening event with champagne, q&a’s on the night with Amanda Stevens, lets write and produce a COASTAL LUXE magazine, Master Styling Class for a small group of guests and video of it all!! Well, as they say, “go big or go home” and that was the theme for this fantastic collaboration. 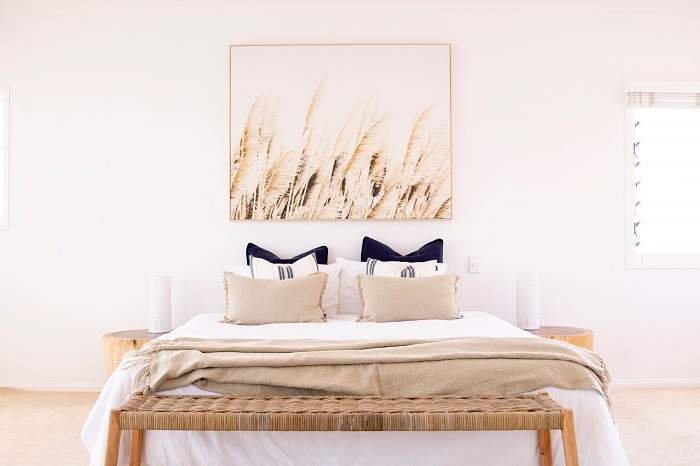 With Coastal Luxe being the interior inspiration and having the absolute joy of choosing all the individual furniture/homeware items from Casa Noosa, the transformation of this home begun (Thanks to Twyalalee and Paul for making this process easy). The basics started by creating the balance of the correct textures, timber, modern finishes and adding touches of black. With the open plan space, I started by choosing a stunning light grey velvet sofa for its texture, button details and offers that Luxe feel, from that point adding two sets of occasional chairs that are low, interesting shapes & textures and of cause comfortable. The living space was anchored with an oversized timber coffee table, being an open plan home it helped merge each area, the same size rugs had been chosen but in different shades of grey to balance the large room. I love dining tables on rugs in an open plan space, it makes it feel luxe and creative way to make the space feel warm and cosy. Layering of amazing timber table, with different seating arrangements helps the room feel relaxed and more family friendly. Casa Noosa has so many fabulous styling items to team up to achieve maximum impact for this home. Outside has the most stunning water views and Casa Noosa has the most stunning range of out door furniture, Perfect match. It certainly is hard to find outdoor fabrics that suits our Noosa sunny and tropical weather, so it is fabulous to have Casa Noosa’s large range. This home is made for entertaining, so a beautiful palette of greys, black and navy was introduced. I kept all the furniture low so from inside it wouldn’t impact the view, but creating that Coastal Luxe vibe. For me, every item was picked for a purpose to suit not only the style, the home, the space, and to offer a feel of functional details. I believe you can have a home that is stylish and functional, it all comes down to the correct design right from the start. And this is something I love to create in every client’s home. Moving onto the Open Home Event, the fabulous Reed and Co team not only organised this but working with them over the past month has been an absolute pleasure. Very professional and hardworking, the whole campaign went so smoothly. So successful in fact that Reed and CO had over 150 of you rsvp to this event, the home on the night was so full of beautiful people who enjoyed champagne and tour of the home. Thank you to Amanda Stevens for being the best MC & making me feel super comfortable and asking simple questions for me to answer haa. And with Adrian and Paul, answering industry questions, so much information was shared. Everyone love it! WOW, what an event, absolutely loved working with amazing and talented teams so watch out the next collaboration event! Thanks for hanging onto until the end, I am forever grateful for all your support.